INCREASE profitsâ€”though prices are lowâ€”with a tractor. 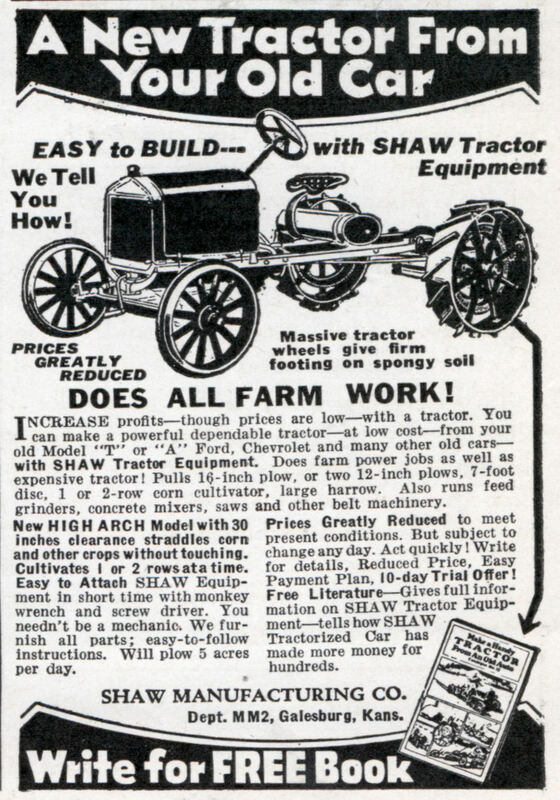 You can make a powerful dependable tractorâ€”at low costâ€”from your old Model “T” or “A” Ford, Chevrolet and many other old carsâ€” with SHAW Tractor Equipment. Does farm power jobs as well as expensive tractor! Pulls 16-inch plow, or two 12-inch plows, 7-foot disc, 1 or 2-row corn cultivator, large harrow. Also runs feed grinders, concrete mixers, saws and other belt machinery. New HIGH ARCH Model with 30 inches clearance straddles corn and other crops without touching. Cultivates 1 or 2 rows at a time. Easy to Attach SHAW Equipment in short time with monkey wrench and screw driver. You needn’t be a mechanic. We furnish all parts; easy-to-follow instructions. Will plow 5 acres per day. Prices Greatly Reduced to meet present conditions. But subject to change any day. Act quickly! Write for details. Reduced Price. Easy Payment Plan, 10-day Trial Offer! Free Literatureâ€”Gives full information on SHAW Tractor Equipmentâ€”tells how SHAW Tractorized Car has made more money for hundreds. My grandparents had one during the Depression… Many folks who bought cars in the 1920s couldn’t afford to operate them after the Crash – and such practical conversions were popular. As a boy in the 1950s, I used my neighbor’s Model-T tractor. Even then, it was considered an antique oddity and everyone assumed it was self-made. I do remember SHAW logo on the steering wheel and wondering what a “SHAW” was. Now 50 years later. the mystery of the tractor is revealed. I looooove the Internet! Cool. When I tire of my Prius, I know what I can do with it!